Therapy-naive TNBC tumors are classified into subtypes on the basis of distinct spatial localization of CD8+ T cells. (A) Representative images of CD8+ T cell staining at the tumor margins (top panels, dotted lines) and in the tumor core (bottom panels) (n = 38). Scale bars: 100 μm. (B) Quantification of CD8+ T cell densities at the tumor margins (marCD8) and in the tumor core (corCD8) (n = 38). (C) Comparison of strCD8 with sTILs and epiCD8 with iTILs (n = 38). Data were analyzed using Spearman’s correlation. (D) Working model of TNBC grouping based on CD8+ T cell localization. Black, green, blue, and red represent ID, MR, SR, and FI tumors, respectively. 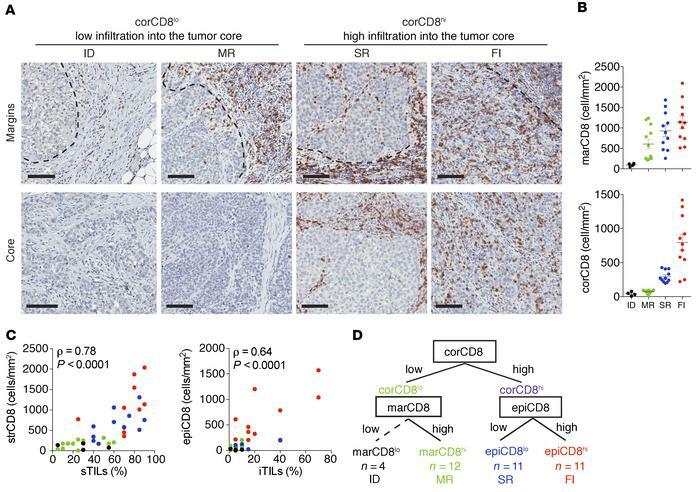 marCD8, corCD8, strCD8, and epiCD8 are the CD8+ T cell densities in the tumor margin, core, and stromal and epithelial compartments, respectively. Data represent the mean ± SEM.